"Ethel Waters on Kraft Music Hall"
Born October 31, 1896, in Chester, Pennsylvania, her eighty year life was a turbulent one filled with low valleys and high peaks. In her autobiography, "His Eye is on the Sparrow," she frankly detailed the nastiness of her childhood and early struggles. After many amateur night performances in Philadelphia Ethel's singing career began. Then she slowly moved into the Black theater route, where she was nicknamed as "Sweet Mama String bean." 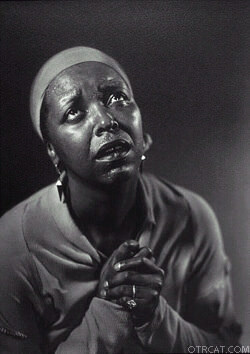 To attain the lofty position she reached as a headliner, Ethel Waters must have been the pacesetter who unfastened all the theatrical doors which were, until then, closed to African American entertainers of her day. She strived long and hard to accomplish solo star standing in the white world of Broadway Theater, night clubs, vaudeville, radio, films and television. Recordings are great, but one other thing I failed to mention is I am forever grateful for the ball pen you include with each order I place with you. They are sure shots. Always work never skip, and are fast when writing with them, thank you so much. I really enjoy the service's you provide. She was the greatest jazz singer and performer of our time..saw her performing in summer stock during tbe 1950's..don't miss her memorable performance in the movie "Cabin in The Sky"